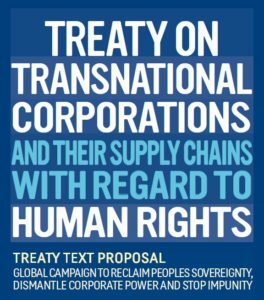 I speak on behalf of CETIM and the Global Campaign to dismantle corporate power, a global network representing more than 200 movements, organizations, trade unions, peasant organizations, indigenous peoples, communities affected by the activities of TNCs and many other sectors from all over the world. We would like to bring our input to this discussion and our assessment on the guiding questions to the present informal consultation. About the scope, we recall that this is a subject that was already discussed during the two first sessions of the Working Group. We would like to remind that the Resolution 26/9 is very clear about the goal of this process : elaborating an international legally binding instrument on transnational corporations and other business enterprises, knowing that these other enterprises are denoted as those having an international character in their operational activities, not applying to local business registered in terms of relevant domestic law. In result, the issue of the scope was tackled in the “Elements Paper” presented by the Presidency during the third session of the Working Group. The “Elements Paper” clearly says that based on the deliberations of the first two sessions, the objective scope of the future legally binding instrument should cover all human rights violations or abuses resulting from the activities of TNCs and OBEs that have a transnational character, regardless of the mode of creation, control, ownership, size or structure. A transnational corporation, whatever its specific legal form and status, is a company operating in more than one State, or a group of companies operating in more than one State, controlled by a decision-making centre. The control may be exercised directly, indirectly, financially, economically or otherwise. The decision-making centre is sometimes called the “parent company”, and may comprise extensions into other countries. Among the controlled companies are “affiliates”, “branches” and others. If the TNC consists of only one company, this company is the TNC’s “parent company”. TNCs can be public, private or mixed. For the purposes of this Treaty, the TNC supply chain consists of companies outside the TNC that contribute to the operations of the TNC – from the provision of materials, services and funds to the delivery of products for the end user. The supply chain also includes contractors, subcontractors or suppliers with whom the parent company or the companies it controls carry on established business relations. The TNC may exercise influence over a supply chain company depending on the circumstances.